In my previous post, I concluded that the conscious states of human beings were far too complicated to allow an algorithmic decision on whether or not they are candidate for the euthanasia and assisted suicide. The argument may not be all that clear to anyone who does not have psychiatric experience so I thought I would add more examples, These are all fairly standard clinical scenarios but not specific case reports. Scenario 1: A 65 year old man with a long history of alcoholism presents for assessment of possible bipolar disorder. He is euphoric, grandiose, and appears to be mildly intoxicated. The psychiatrist performs a clinical interview that includes a standardized cognitive screen. On the cognitive screen the patient performs perfectly for a person with his level of academic and occupational achievement, including on all tests of short term and working memory. He returns two weeks later for follow up and does not recall ever meeting the psychiatrist or doing the cognitive exam. Scenario 2: A 42 year old woman with a history of bipolar disorder presents for follow-up from a recent hospitalization. Her psychiatrist also works in the hospital and provided her care when she was in the inpatient unit. During the follow-up visit the patient asks her psychiatrist if she recognized the fact that she was "not myself" either in the hospital or at the time of discharge. When asked to be more specific she said that she was very angry and had attempted to drown herself while in the hospital but did not disclose that to the psychiatrist or nursing staff. She criticized the psychiatrist for not recognizing that and suggested that she should never have been discharged. Scenario 3: A 50 year old woman is being seen for depression. She has had recurrent episodes of depression following an episode of postpartum depression at age 28. She has been on maintenance antidepressant therapy since age 28 and requested this appointment because it seemed like the maintenance therapy was no longer as effective. In the appointment she appears to be mildly depressed. She has some depressogenic thinking that does not seem much different from many other similar episodes in the past that generally required minor adjustments of medication and supportive psychotherapy with cognitive-behavioral interventions. Those changes were made and suicide risk was assessed in a standard way by her psychiatrist. She has no past history of suicide attempts. Deterrents to suicidal behavior were discussed and she reminds the psychiatrist that she is very religious and her religion has a strong proscription against suicide. A follow-up appointment is set. Three days later, the patient's husband calls the psychiatrist to let her know that the patient attempted suicide and is recovering in a local hospital. Scenario 4: A 22 year old man is being seen for heroin addiction and depression. He is hospitalized following an accidental heroin overdose and contemplating transfer to residential treatment for substance use disorders. During the interview he discusses his depression as the result of guilt and regret from some of the activities he has engaged in to have a steady supply of heroin. He talks about those activities in detail including stealing from his friends and family, dealing drugs, and and in one case witnessing an episode where drug dealers severely beat up one of his acquaintances to the point that person nearly died. He concludes that all of these activities are "not me - I wasn't raised this way. I have values and I don't break the law. Now I break the law every day and it is just a matter of time before I end up in prison. I can't do this anymore." The psychiatric consultant asks him about the decision to go to the rehab hospital so that arrangements can be made and the patient says: "I don't think that I am ready to stop using heroin yet"
This is a short list of what I see as changes in conscious state that are not well captured or described in the current psychiatric nomenclature. Part of that comes from the fact that psychiatry is a subspecialty of medicine and all medical classifications are by their nature imprecise, linear and somewhat static. The ideal medical diagnosis implies a certain general course and prognosis. That selection process will find static linear processes more ideal in terms of meeting those criteria than dynamic processes that can change minute to minute or hour to hour. Human consciousness changes on that shorter time frame, is nonlinear and therefore unpredictable. There certainly can be more drastic and persistent changes in consciousness that are more easily recognizable-like delirium or dementia. Even the scenarios outlined above suggest significant disruptions in consciousness to the point that result in amnesia, unpredictable suicidal behavior and suicide attempts, and drug addiction. Some would consider the alcohol induced amnesia or blackout to be the more severe disruption, but that is purely a subjective judgment. It is possible for people to have hundreds if not thousands of blackouts and appear to be functional during that time. That is certainly a major problem and a high risk problem but no more risky than a suicide attempt that results in hospitalization or the decision to continue heroin right after an overdose as tolerance is waning. Recognition that these conscious states exist makes a psychiatrist a far better clinician. He or she is much less likely to get angry or upset about unpredictable events like suicide attempts and relapses to drug or alcohol use. An appreciation of the fluidity of human consciousness, precludes any angry or blaming of the patient for something that happens outside of a limited standard evaluation. There is a strong tendency of physicians who are unaware of this phenomenon to either get angry and think that the patient lied to them in the original assessment, adopt the fatalistic attitude that these events are all unpredictable and nothing can be done about them, or adapt a paternalistic attitude and sympathize that the person has a mysterious disease that they should not be blamed for. None of these attitudes captures the true conscious state of the individual. Are there any interventions that can be done to reduce the risk from these rapid changes in conscious state? That is currently an empirical question. A lot depends on the ability to detect persons with the problem. There are certainly plenty of people who told a physician that they were not suicidal and who went on in a short period of time to attempt or complete suicide. In some cases the survivors are available for interview. In hospital settings interviewing survivors of self-inflicted gunshot wounds it is very common for the patient to recall pointing the gun at themselves but not recall pulling the trigger. Survivors who have jumped off the Gold Gate Bridge almost all regret jumping when they were a few feet away from the rail. At the minimum this suggests that the conscious state of the actively suicidal person is transient and impulsive as in unpredictably driven to act on the suicidal plan. 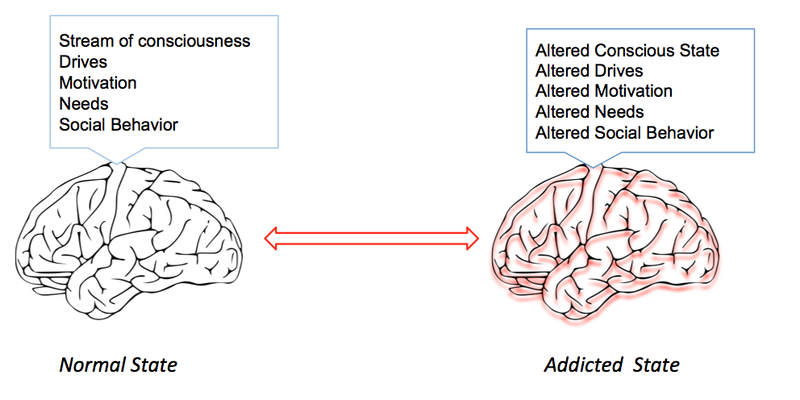 Young opioid addicts are very common these days and generally personify the Hijacked Brain Hypothesis or a brain that is biased to continue an addiction and the associated behaviors that are in stark contrast to their previous moral development and educational and vocational trajectory. Any clinician who is aware of these changes in conscious state can educate the patient about what is happening. During an assessment of suicidal risk after a discussion of all of the risk and mitigating factors, I think that it is reasonable to have a discussion with the patient about their current conscious state and risk based on that conscious state as well as the fact that conscious states change in some cases to a high risk state. Any psychiatrist who has interviewed survivors of suicide is often struck with what that person describes as a clearly different state of mind from the one being experienced in the interview. In some cases that altered state is drug induced. The DSM-5 catches a glimpse of these phenomena with two tables on Neurocognitive domains on Page 593 and Diagnoses associated with substance class on Page 482. Both categories recognize that changes can be transient and limited to intoxication or withdrawal states, but there are also some persisting states depending on the intoxicant. The table on neurocognitive domains lists some subtle manifestations of known brain disorders. The DSM-5 does not look at the more subtle changes as noted in the above 5 scenarios or even in everyday life. Another limitation of medical diagnoses is that they work the best in extreme states where there are obvious problems. Everyday life and the kinds of changes we all observe in our spouse or parents in any given environment are the most subtle yet. I hope that these examples have made it clear that psychiatric practice is much more than categorial diagnosis and risk factor analysis. If there is any hope for a 21st century psychiatry - this is where I would put my marker - not on the same diagnostic system and mental exam that we have been using for the last 50 years and certainly not on a checklist and mass medication approach being promoted as collaborative care. A focus on consciousness is the best way to help our patients and the best way to learn how the brain is really working. 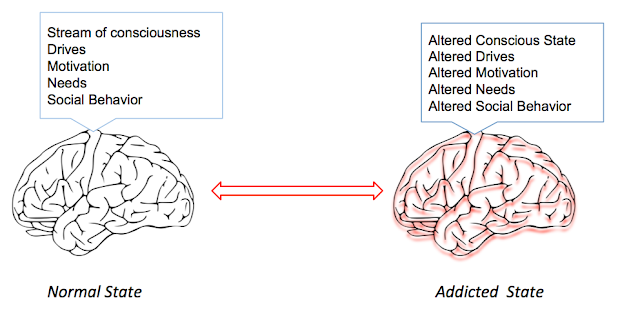 The graphic at the top is part of one slide from one of my lectures on the neurobiology of addiction. My emphasis to the students is human consciousness and why it is unique. I try to get them to think outside of the DSM-5 box when considering how the patient changes on a practical basis day-to-day and how that relates to neurobiology.